Inline security tools operate by actively preventing threats in your network, but deploying and optimizing these tools presents several challenges to both network and security engineers. The downsides can include a potential point of failure, degradation of network and application performance, difficulty to scale and upgrade. The use of a next-generation packet broker and its inline bypass functionality can mitigate these challenges. Join Gigamon and (ISC)² EMEA in this webinar where we aim to examine how inline bypass can overcome physical deployment obstacles, maximize network availability, increase the scale of inspection and reduce the impact to network performance. And by blocking stop them all. So, what do you do during an active security incident? When is the proper time to whack-a-mole with your mallet? Is it better to light everything on fire and start over, or should you make observations a key component of your response and mitigation strategy? In this webinar, we'll discuss strategies for when it's time to scorch the earth versus sit back with a cup of tea, gaining intel into what active adversaries are doing in your house. •Context is king. We’ll explain the important questions you need to be ask when scoping an incident to get an improved view of the situation. •Thinking fast and slow. It’s understandable to want to nuke everything from orbit just to be thorough, but it’s usually not the smartest play. We’ll outline the potential benefits and risks of hasty containment and remediation efforts versus slow, thoughtful analysis when executing a response game plan. •The law of diminishing returns. There can be a tipping point where the cost of your decisions and polices no longer justify the answers you’ll find. We’ll talk you through some tactics to find the sweet spot between effort and return. It’s time to face a hard truth: modern enterprise networks can be extremely – sometimes painfully – complex to manage and defend. Increased network speeds to 100Gb, unfettered access to cloud applications and end-to-end encryption are just some of the requirements of today’s employees. When you add in mobile and IoT devices, the complexity grows exponentially, especially when it comes to the security of the networks to which they connect. And when we couple expanding networks with security needs, many organizations struggle to protect their users. This leads to conflicts between NetOps and SecOps goals. The networking team is concerned about availability and performance to ensure the business is being conducted whereas the security team needs to ensure the data and the users are safe from bad actors. We will discuss how pervasive network visibility improves security tool utilization and can shorten detection and response times. We hope this webcast will inspire you to reassess the current state of your network and security infrastructure to enable collaboration between the two teams and improve your security posture. Watch now! Enable IT Collaboration with a Common Distributed Data Services Layer. The IT environment is rapidly changing, becoming more distributed and complex as organizations transform themselves to provide better digital experiences. Because these improved experiences will be more dependent on the network, it’s imperative for organizations to properly plan and prepare now to eliminate security blind spots. The bottom line is that companies need complete visibility into their physical, virtual and cloud infrastructure to detect and contain data breaches and mitigate risk. To accomplish this, successful organizations resist the legacy mentality that relies on more people and more tools at every location. Instead, they are turning to a new architectural approach that disaggregates the speed of the network from the speed of the tools inspecting traffic on that network. This innovative approach allows enterprises to absorb change in network speed and technology without compromising security. ESG believes the foundational step in this approach is to ensure comprehensive infrastructure visibility across data centers and distributed edge and cloud environments. To do this, organizations must have a common distributed data services layer that can collect, process and distribute the right information to the right tools at the right time. Join us to learn how a consolidated network architecture that includes security delivers better visibility, reduces complexity and increases tool efficiency. Despite the insatiable demand for bandwidth, organizations still need to inspect and enforce network security policies at wire speed. And that is particularly challenging when you are upgrading networks from 10GB to 40GB or from 40GB to 100GB. Find out how both network and security teams can collaborate faster and safer during network upgrades to solve security headaches – register today! Die meisten Security Unternehmen haben viele Applikationen in ihrem Netzwerk laufen. Viele Firmen wissen jedoch nicht, welche Applikationen die meisten Ressourcen benötigen, da ihnen die volle Visibilität in ihre Netzwerkdaten fehlt. Security Budgets werden oft gekürzt, so dass viele Unternehmen eine Herausforderung damit haben, den erhöhten Bedarf diesbezüglich zu decken. Diese Ineffizienz resultiert oft darin, dass der gesamte Netzwerkverkehr von allen Netzwerk- Security-Tools analysiert wird, auch wenn das gar nicht notwendig wäre. Während viele Firmen den Fokus auf ihre Security Tools legen, wird häufig aus den Augen verloren, ob alle relevanten Daten oder zuviele Daten dort ankommen, die diese Tools vielleicht gar nicht analysieren können oder müssen. Die Security Operation Center sind jedoch abhängig davon, Netzwerk-Events zu sammeln, zu korrelieren und auswerten zu können, so dass sie potentielle Security Bedrohungen schnell identifizieren und beantworten können. An die richtigen Daten aus dem gesamten Netzwerk heranzukommen, und gleichzeitig die Systeme nicht zu überlasten, kann eine große Herausforderung sein. Application Intelligence bietet Ihnen spezifische Informationen über alle Applikationen, die durch Ihr Netzwerk fließen. Im Security Kontext ist dies besonders nützlich, weil die Security Appliances sprichwörtlich nach der Nadel im Heuhaufen suchen, um in den steigenden Datenmassen von Netzwerkflows Bedrohungsmuster zu finden. Sehen Sie sich unser Webinar an, um zu verstehen, wie Sie Ihre Netzwerk- und Security-Tools effizienter nutzen können, um Ihre Netzwerk Infrastruktur zu schützen. La plupart des équipes opérationnelles de sécurité ont une compréhension globale de ce qui transite sur les réseaux. Cependant, la majorité n’ont pas une visibilité précise des applications qui consomme les ressources. Alors que les budgets de sécurité sont réduits au maximum, les entreprises doivent lutter pour supporter une demande accrue. Les inefficiences font souvent que tout le trafic est analysé et inspecté par tous les outils de sécurité du réseau, que le traffic soit pertinent ou non. Tandis que de nombreux administrateurs concentrent leurs efforts sur les outils de sécurité et leurs outils SIEM, l’acquisition du trafic pertinent est souvent négligée. Aujourd'hui, le centre d'opérations de sécurité (SOC) dépend énormément de sa capacité à collecter, corréler et analyser les événements réseau afin d'identifier et de réagir rapidement aux menaces à la sécurité. Mais l'accès aux trafic approprié et pertinent sur l'ensemble du réseau et sans surcharger les outils peut s'avérer être un réel défi. Rejoignez-nous pour comprendre comment tirer meilleur parti de votre réseau pour améliorer votre efficacité de vos outils de sécurité. Whilst many users will focus their efforts on the Tools and their SIEM tools, the acquisition of this traffic is often neglected. Today’s Security Operations Centre (SOC) depends heavily on the ability to collect, correlate and analyse network events to quickly identify and respond to security threats – but getting access to the right traffic data from across the network, and without overloading the system, can be a challenge. Most Security Operations organizations have a broad understanding of what applications are running on their network. However, many have no visibility into which specific applications are consuming resources. While Security budgets are stretched thin, organizations have to struggle to support increased demand. Inefficiencies often result in all traffic being analysed by all network security tools, whether it is relevant or not. Application Intelligence provides specific information about all the applications streaming through a network. In a security context, this is especially useful because security appliances are looking for the “needle in the haystack”; that is, to identify the one single sequence of threat packets or flows from the entire mass of network flows. Join us to understand how you can better utilise your network and security tools to protect your network infrastructure and ensure your end-users receive the best service. Trotz der unstillbaren Nachfrage nach Bandbreite müssen Unternehmen die Sicherheitsrichtlinien des Netzwerks immer noch schnell überprüfen und durchsetzen. Das ist besonders schwierig, wenn Sie Netzwerke von 10 Gb auf 40 Gb oder von 40 Gb auf 100 Gb aufrüsten. Nehmen Sie teil am Webcast von Daniela Fusaro, Senior Solutions Architect bei Gigamon. Sie erläutert, wie Sie die mit diesen Netzwerkupgrades verbundenen Sicherheitsrisiken lösen, Ihre Sicherheit stärken, die IT vereinfachen und Kosten senken können. Finden Sie heraus, wie sowohl Netzwerk- als auch Security-Teams bei Netzwerk-Upgrades schneller und sicherer zusammenarbeiten können, um Sicherheitsbedenken zu lösen - registrieren Sie sich noch heute! Imagine what a security analyst could deduce if they had visibility into all the common applications flowing through their network. They could optimize the data being sent to security tools, correlate information across the various protocols to know who is talking to whom and get visibility into malware and bad actors that may be hiding on the network. Many enterprises aggregate information from various sources, such as events and logs from DNS servers, web servers and security tools, to hunt for threat events and indicators of compromise. But these are not reliable sources; logging can be turned off inadvertently or for performance reasons. Raw network data is the ultimate source of truth – but sending it all to a SIEM can become very expensive. •Identify which applications are contributing to network traffic. •Use application metadata to gain more context of potential threat events and to more easily enforce corporate compliance. •Lower tool cost and improve tool efficiency by filtering out low-risk, high-bandwidth traffic. •Send suspicious traffic to a tool on-demand when an anomaly is detected. If you need to monitor, identify, and filter application traffic so you can more easily identify anomalies and lateral propagation of threats, you’ll want to attend this webinar! In this webcast Ollie Sheridan, Principal Engineer at Gigamon talks about the benefits of moving your SOC into the Cloud and how this differs from the challenges of creating a SOC yourself by combining monitoring tools and integrating them into an onsite SIEM. Ihr IT Netzwerk ist von entscheidender Bedeutung für den Betrieb, und das macht es zu einem beliebten Ziel für Cyber-Bedrohungen wie Ransomware und Verstöße gegen den Datenschutz. Was können Sie dagegen tun? Inline-Sicherheitstools können eine effektive Lösung sein, stellen aber mehrere mögliche Fehlerpunkte dar, zumal die Netzwerkgeschwindigkeiten steigen, und viele Tools sich diesen nicht anpassen können. Wenn diese Tools ausfallen, dann ist auch Ihr Netzwerk betroffen. • Sichtbarkeit für verschlüsselten Datenverkehr zur Erkennung von Bedrohungen. Maximierung der Tool-Effizienz durch Bereitstellung der relevanten Daten für die relevanten Tools und durch das Auslagern prozessorintensiver Aufgaben wie der SSL-Entschlüsselung. Finden Sie heraus, wie sowohl Netzwerk- als auch Sicherheitsteams in einer sich schnell entwickelnden Cybersicherheitslandschaft schneller und sicherer arbeiten können. Votre réseau est indispensable pour vos opérations et pour cette raison, il constitue une cible de choix pour les cybermenaces, telles que les ransomwares et les violations d’accès à vos données. Que pouvez-vous faire ? Les outils de sécurité inline peuvent constituer une solution efficace, mais présentent de nombreux points de défaillance, notamment lorsque les débits réseau s’accroissent, pour la simple raison que ces outils n’arrivent pas à soutenir le rythme de cette accélération. Mais s’ils deviennent inopérants, votre réseau peut le devenir aussi. • Fournir une visibilité complète à travers les environnements physiques, virtuels et cloud. • Extraire des méta-données de façon évolutive pour une informatique réglementaire améliorée. • Isoler des applications pour une inspection ciblée. • Donner une visibilité du trafic chiffré pour la détection des menaces. • Maximiser l’efficacité des outils en acheminant uniquement les bonnes données vers les bons outils et en épargnant à ces derniers, les tâches gourmandes en ressources processeur, telles que le déchiffrement SSL. • S’adapter au débit croissant du réseau sans avoir à extraire et remplacer l’outil rendu obsolète grâce à l’équilibrage de la charge entre plusieurs groupes d’outils. As the volume of encrypted traffic continues to grow, organisations become even more vulnerable to encrypted attacks, threats and exploits that go undetected. Learn how to create a centralised “decryption zone” to decrypt traffic once and give security tools newfound visibility into encrypted traffic. • How the TLS 1.3 draft 28 proposal removes visibility which was widely deployed for threat identification in TLS 1.2. • How to acknowledge and address critical management, troubleshooting, legal, regulatory, ethical and technical concerns. • Why deploying TLS decryption in the core of networks is critical to detecting threats. • How to deploy innovative architectures for TLS decryption while maintaining availability and reliability. • How to manage growing SSL/TLS traffic volumes by creating a centralized “decryption zone” to decrypt traffic once and give security tools newfound visibility into formerly encrypted traffic and threats. Your financial services network is critical to operations and that makes it a juicy target for cyberthreats like ransomware and data breaches. What can you do? Inline security tools can be an effective solution, but represent multiple points of possible failure, particularly as network speeds increase because they simply can’t keep up. But if they go down, so can your network. And the difference of a nanosecond can severely impact currency, stock trading, and critical financial transactions. • Delivers complete network-wide visibility across physical, virtual and cloud environments. • Scales metadata extraction for improved forensics. • Isolates applications for targeted inspection. • Gives you visibility into encrypted traffic for threat detection. • Maximize tool efficiency by providing the right data to the right tools and by offloading processor-intensive tasks such as SSL decryption. • Scale to speed of the network without “rip and replace” by load balancing across tool groups. • Remove single points of failure and increase availability of both the tools and the network. • Give you operational agility to seamlessly add, remove, and upgrade tools, and instantly change between detection and prevention modes. Find out how both network and security teams can operate faster and safer in a swiftly evolving cybersecurity landscape within regulated industries such as financial services–register today! Dieses Webinar befasst sich mit der Beseitigung von Komplexität, der Steigerung der Effizienz von Sicherheitstools und der Verbesserung des Vertrauens in die allgemeine Sicherheitslage Ihres Unternehmens. Daniela Fusaro, Senior Solutions Architect, diskutiert die heutigen Herausforderungen im Bereich der Netzwerksicherheit und wie diese gelöst werden können. Melden Sie sich bei Daniela Fusaro an, um zu erfahren, warum nur Gigamon eine Komplettlösung für Netzwerktools sowie Inline- und Out-of-Band-Sicherheitstools in lokalen, Remote-, virtuellen und Cloud-Umgebungen bietet. Les évolutions technologiques, les nouvelles normes, l’augmentation constante du trafic, la complexité des infrastructures réseau au sein desquelles l’information est de moins en moins visible, ainsi que les cyber-menaces de plus en plus sophistiquées ont un impact majeur sur les entreprises et les obligent à repenser l’architecture de sécurité. Découvrez les raisons pour lesquelles Gigamon propose la solution la plus complète et efficace pour la connectivité des outils en mode « inline et Out of band » au sein des environnements physiques, virtuels et de cloud public. This webinar looks at how to eliminate complexity, increase efficiency of security tools, and improve confidence in the overall security posture of your organisation. Adrian Rowley, Gigamon’s Technical Director for EMEA, will discuss todays challenges in network security and how these can be resolved. 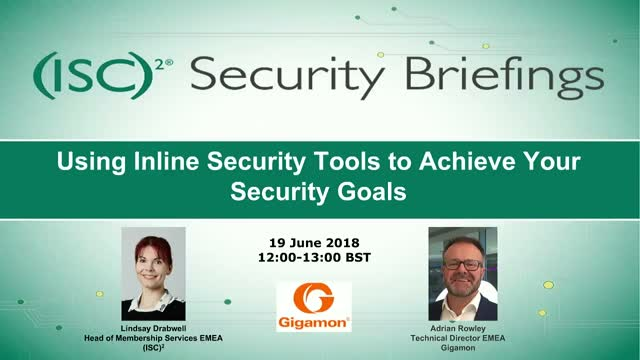 Join Adrian Rowley to see why only Gigamon provides a full solution for networking tools and inline and out-of-band security tools across on-premises, remote, virtual and cloud environments. Veuillez nous rejoindre afin que l'expert sécurité de Gigamon, Pascal Beurel, vous révèle la raison pour laquelle les métadonnées réseau constituent un outil ultime ! Alors que les entreprises s'efforcent de suivre le rythme de la croissance du trafic en augmentant la vitesse des réseaux, elles sont en voie de perdre le combat face au cybercrime. Pourquoi ? La raison en est que les outils sont limités quant au volume de trafic qu'ils peuvent traiter de façon intelligente, tout en étant en charge de fonctions de plus en plus sophistiquées pour combattre des cyber-attaques toujours plus avancées et persistantes. En conséquence, de nombreuses applications de sécurité s'avèreront inefficaces dans un avenir proche. Entrez dans le monde des métadonnées, le nouveau super-pouvoir en matière de sécurité. En fournissant aux outils de sécurité des aperçus synthétiques des données circulant à travers les réseaux, ils peuvent devenir un outil puissant pour les entreprises cherchant à séparer les signaux utiles du bruit, à réduire le délai de détection des menaces, tout en améliorant l'efficacité générale de la sécurité. - Comment la sécurité réseau s'appuie de façon croissante sur le contexte et l'intention. - La raison pour laquelle les métadonnées réseau deviendront l'approche la plus simple et la plus compréhensible pour les analyses de sécurité. - Comment la visibilité réseau sert de source unique d'informations concernant les applications, les utilisateurs et les terminaux. Si la visibilité réseau et la sécurité sont importantes pour vous, vous ne voudrez pas manquer ce webcast ! Gigamon provides active visibility into physical and virtual network traffic, enabling stronger security and superior performance. Gigamon’s Visibility Fabric and GigaSECURE, the industry’s first Security Delivery Platform, deliver advanced intelligence so that security, network and application performance management solutions in enterprise, government and service provider networks operate more efficiently and effectively.